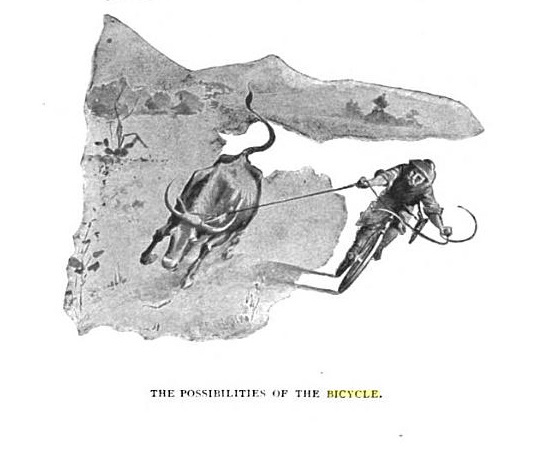 This quote is attributed to something called Bearings, “the recognized authority on cycling matters,” as quoted in Etiquette and Bicycling, for 1896. It is the best summation about etiquette I think I’ve ever seen. Please apply this as you want, but today this is applied to the emergence of bicycling culture. In 1896, it was a total gamechanger, allowing people to travel through surrounding areas instead of staying in their towns, and emancipating women from “slavish conventionality in both dress and conduct.” Well, maybe not. Women were still “ladies,” and despite the ability to cycle about town, there were still a lot of rules to adhere to. An unmarried cycling woman had to be chaperoned by a married woman, and married women had to be accompanied by their groom or another woman. Occasionally, married women trained had a “servant trained in the art” in order to adhere to this convention. And though women were reminded that “modesty is becoming at all times,” bloomers were acceptable. Things were much different for experienced “wheelmen,” though the book admits that one of the draws of cycling was it was something men and women could do it together. It was therefore customary that men hold the handles as a woman mounts her bike, from the left with her right foot on the pedal. The book argues, “Let the new woman prate as much as she please about her independence of man, but she is the first nevertheless to rise up in indignation if any of the same old time chivalry is omitted.” Therefore, the author concludes, the man will do everything in his power to make the woman comfortable. This would be hilarious if I hadn’t met men who still think this way. Okay, this is getting exhausting. How about some general ideas for bicycle etiquette? Social Etiquette, Or, Manners and Customs of Polite Society by Maud C. Cooke says that bikes are welcome in houses of worship, so “don’t absent yourself from church to go wheeling.” Also “don’t leave your bicycle in the lower hallway of your flat house,” which is absolutely applicable today. Pass on the right, and don’t speed down hills with curves at the bottom. However, she does advise “sweaters worn like a Chinaman’s blouse are almost indecent.” Whatever that means.